As both sides gird up for a showdown, whether or not it will take place is anyone’s guess, given the dense blackout of secrecy on the duelers’ intentions. When Prime Minister Binyamin Netanyahu returned home from a visit to Washington, which he cut short after a Hamas rocket hit a home in the Sharon region, he went straight into a conference with Chief of Staff Lt. Gen. Aviv Kochavi and top security officials. Their most pressing concern was how to get around the stumbling block of Hamas’ March of Return anniversary, which the Palestinian terrorist organization means to celebrate to the full, meaning a larger than ever mass onslaught on the Gaza border and the IDF military defenders this coming Friday. After that, Hamas may – or may not – be more accommodating on terms for a ceasefire, but not before. Hizballah is contemplating limited or token action against Israel as a show of solidarity with the Palestinian terrorists. Hiamas’ political leadership is deeply divided on whether or not to continue its rocket offensive against Israel. Israel’s decision-makers also appear to be at cross-purposes. One school of thought advises taking advantage of the controversy in the Hamas leadership to strengthen the “moderates.” The opposite side argues that Hamas is setting a trap for the IDF. They say that Hamas leaders want the breather they would gain from a phony ceasefire in order to then catch Israel off guard. Israel was indeed caught napping by the Hamas rocket fired at Tel Aviv on March 14 and again on March 25, when a home in the Sharon town of Mishmeret, 120km from Gaza, took a direct rocket hit. Israel’s leaders and generals must on no account be lured once again by Egyptian assurances that this time, Hamas is really, really turning over a new leaf and has committed to a truce. Lt, Gen. Kochavi leads the second camp which refuses to be taken in again by Hamas’ wiles. 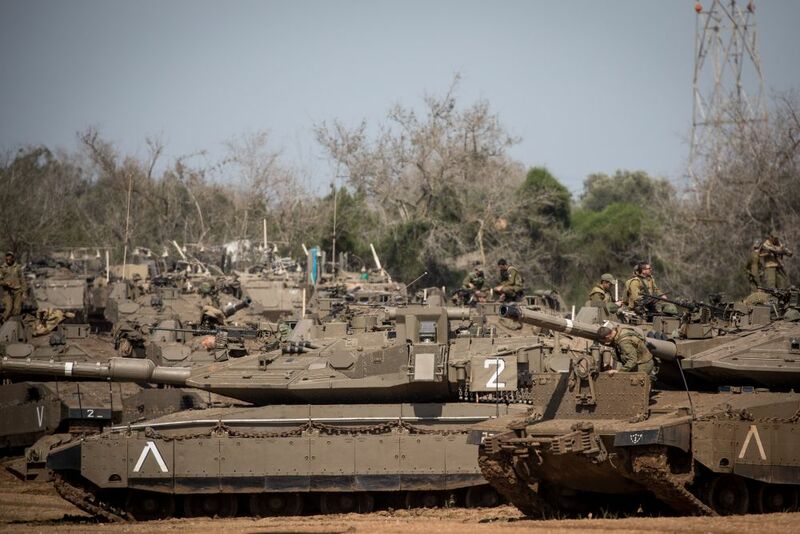 He is preparing the IDF for combat in the Gaza sector that could last some days.. During the conference with Netanyahu in his capacity as defense minister, Kochavi issued the order to continue boosting the forces massing on the Gaza border and mobilizing reservists. DEBKAfile’s military sources report that it still could not be said with certainty that the Israeli government and high command were decided on their next step, when the decision was taken out of their hands by another Hamas rocket fired Tuesday night against the Eshkol district. This rocket drove home the harshness of their dilemma. No serious offensive can be conducted against Hamas and the Islamic Jihad in Gaza without exposing large parts of the country beyond the immediate Gaza neighborhood to the high risk of Palestinian rockets. On the other hand, inaction against Hamas; armed wing, aside from air strikes on empty buildings, only whets the Palestinian terrorists’ appetite for more escalation. what side is neville netanyanu on .will he back his general ! Say no to the bad IDF and their unjustified aggression on the brave Palestinian heroes! There were couple misfires, but unintended to harm, from the peaceful Palestinian Gaza, this is almost true but highly exaggerated. Anyhow the bad IDF has no right to bomb! Why bomb peaceful heroic Palestinian people? All they want is only to clear out the whole Palestine of the bad Jews, that’s all. This bad action of the bad IDF requires strong actions. Long live Hamas and long live Ilhan Omar the revered DBS international supporter! Oh man,,,,,you are so full of sh t! Let the Rabbi give a special dispensation like he did for the buses and spray pig squeezing over the rioters with drones when they go to rush the border. Respectfully, Marg: it’s quite pleasurable to let the swine screw you. It takes the mind off of Nasrallah. BDS in partnership with terrorists. BDS Monster: Are you one of the Jewish self-haters or another Islamic terrorist – actually you are all the same and in cahoots. there must be a definitive end this time. hamas must he removed and an independent authority created to rule gaza, or Egypt administration. in a reply to Captain Ramsey. This reaffirmed the position given on 14th September the year previous. ‘City bombing’, he emphasised, ‘was absolutely contrary to international law’. Great………………………….now please communicate that to your friends in Hamas and Islamic Jihad….OK? Don’t forget to leave a hole in the border fence with Egypt, it is humane to leave a way out. The world needs to understand that jihad is messy business…. It is time for Israel to take back Gaza and the West Bank and send the Palestinians back to Jordan. ………………………….and to Lebanon, Syria, Iraq, Egypt, Libya, Saudi Arabia and the Gulf Region from where their family clans all originally came from……………long before renaming themselves “Palestinians”. I have never known Muslims, Palestinian, or any other Muslims seek truce, peace agreements, or peace treaties, to be anything but ‘rest-stops’ to rest, rearm, and attack the infidel, and the dhimmi, at every opportunity. The time has come for the Israelis to aim at the Palestinian Arabs leadership. They are all running for cover but they can’t run away from Gaza and I suspect their actual hiding holes are well known. Go get them, IDF! The IDF is obviously not going to do anything. Even if they go to war they are not aiming to win. So save a lot of Israeli soldiers lives and stop trying to put up a show. Everybody knows you are bombing empty building so why bother. Those are nice pictures of a fireball of an empty building. Do it on a Hollywood set instead. Hamas handed you the opportunity. If you can’t stop the missiles today- You’ll be buried by them in a year. No time like the present to make up for your lack of resolve in the past. I have to agree to agree with you completely. Hamas and Co. are playing with fire. If you play with fire, you get burned. send the paleswines into the ocean. IDF, use you might and turn Gaza into an ashtray. Long live IDF, Long live Israel. Israel has milked this cow dry. If Gaza was such a threat they would have cleaned out the next of vipers years ago. Instead they allow their southern citizens to live in fear in order to show the world how unfair the Arabs treat them. If the Arabs are a problem then do something, if not quit talking about it. What happened to the brave Jews from 1948 -1973? Something happened in 1981 when Israel left Lebanon. Their spirit and will to resist has been broken. The Terrorstinians/Killerstinians must be stopped permanently from attacking Israel. If Israel is to deliver the message that attacking Israel for any reason is unacceptable, then it will have get serious about wiping out Hamas, Islamic Jihad and the others and then establishing control over what is now a terror state that targets Israel. The real issue here is the ADN. Why there is unrest and extreme violence since decades all over the Arab World? Common Sense: Hamas, Hizballah,and all supporting organizations are terrorists. The Koran forbids making a lasting peace other than for purposes of regrouping, regaining strength for the ultimate battle intended to result in muslim victory, in this case the decimation of the Jews and unbelievers. ALL the Jews and unbelievers. Israel has to irrevocably remove the ability of these terror organizations to wage war against them. They are NEVER going away on their own. As long as these groups have capacity to wage war on Israel, they will. I’m still afraid. REALLY afraid. I guess the only thing left to do is take it in the back side from a pig, like mom and dad told me. Mom and dad had bratwurst at my bar mitzvah. I was nervous–very nervous–so guess what I did with 3 of the bratwurst? It was the must fulfilling day of my life. Lesson from the Muslim treaty of Hudaibiya = Muslim treaties with non Muslims are non binding. Muhammed attacked the Meccans after signing the treaty of Hudaibiya. Attacking and killing Meccans was an obvious violation of the treaty of Hudaibiya, but the victims did not want war with Muhammad and thus did not march against him. Yet, Muhammad jumped on the first excuse to attack Meccans who were not threatening him. His adversaries wanted peace, but he wanted power. Needless to say, they had little choice but to surrender to him without a fight. If you want to know what your future is with Muslims then just look at the past. Bibi’s Only option now is a full scale blow, from which the two-legged hamas rats would not recover ! Poor locals will suffer. Tanks may not work in this region. Take out the leaders like Nasrallah and Haniyeh. There will be NO Resistance left. War is the art of depriving your enemy of hope. The IDF has that capability, and since Hamas has never relented in their goals, it is time to take the gloves off.